Back in the day when I first started going to gigs, technical glitches were almost obligatory. One would regularly read of fuses blowing, lighting rigs collapsing, amps exploding and, most alarming of all, musicians being electrocuted by poorly earthed mikes. I had thought most of that sort of thing lay in the dim and distant past. But apparently not, as the unscheduled break during this gig attested. During the first half-a-dozen or so songs performed this evening, there had been within each a momentary dropping out of the sound – just a split-second or so, but certainly noticeable. Finally, someone somewhere decided enough was enough; cue Andy McCluskey's announcement that the band were going to have the leave to stage “for just three minutes, to allow the digital mixing desk to do a dump” A technical term, I am sure. Which was a bit of a shame, as McCluskey had seemingly effortlessly - as all good front men should – fairly swiftly gathered the Glasgow audience into his fold, and had had us all up and dancing, even to the new tunes. 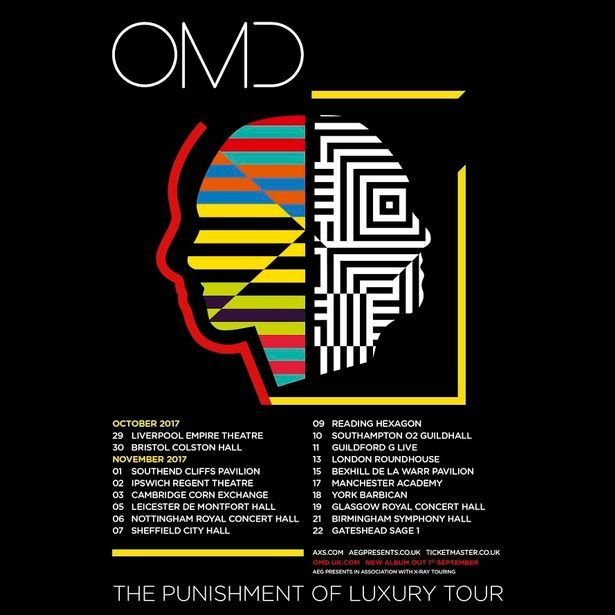 I particularly enjoyed Isotype – one which harked, more than a little, back to the sound of OMD's debut album, I felt. Twenty (rather than three) minutes later, the band returned and wisely jumped straight into Enola Gay – clearly an attempt to recapture the vibe with minimum fuss – and the place was up'n'jigging once more, as if the band had never left the stage. Following up this favourite with a quartet of songs from 1981's Architecture and Morality album didn't hurt. But from there on in, though, it was mostly a case of trotting out those mid-Eighties hits the boys had enjoyed: Sailing on the Seven Seas, Locomotion and the like, to the general delight of almost all present, it has to be said. 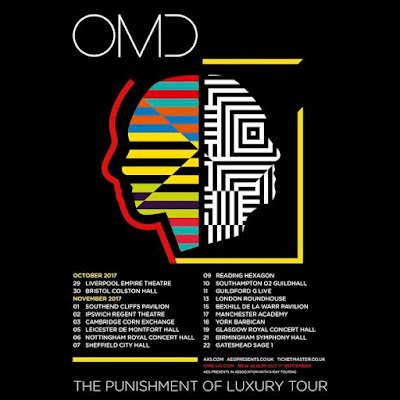 I have written in earlier postings about my general indifference towards OMD's post Dazzle Ships output, but all the bods around us clearly loved these tunes. Each and every one of the little buggers. The title track from the new album The Punishment of Luxury was slipped in during this “Greatest Hits” section, and it really did not appear out of place. The band's first single Electricity closed the evening. Still sounding as fresh as it did back in 1979 – indeed as it did two years earlier when Kraftwerk wrote the synth riff, which the boys (ahem, allegedly) appropriated.